The festive period might be well and truly in our rearview mirror, but Spring is far from sprung and we’ve still got some bitterly cold evenings on the horizon. We all know that cold weather unfortunately means icy roads and that driving in icy conditions should not be taken lightly. Aside from a set of winter tyres, awareness of your surroundings and the dangers of unseen icy patches are your best defense against accidents during the the colder months. Prepare yourself for the perils of driving in sub-zero temperatures by taking a look at our guide to keeping safe on icy roads. With the help of this simple guide, braving the cold will be a breeze. As mentioned earlier, a set of specific winter tyres can be a crucial bit of kit, during the winter months. Think about it this way, your tyres are the only point of contact between your car and the road and should be kept in tip-top condition. Make sure to check the tread depth on your tyres, as a minimum tread depth of 1.6mm is absolutely essential when you will be driving on ice. Even gritted roads can suffer from from a lack of traction in icy conditions so – if you are going to be driving on icy roads – always double check that your tread depth cuts the mustard. Visibility can be poor when you are driving in icy conditions. Make sure to use dipped headlights so that you and your vehicle are clearly visible to other road users. First things first – before you brave any icy road conditions – make sure neither your headlight or tail light bulbs are in need of replacement. Now that you’re sure that your fellow motorists can see you, it’s time to make certain that you can see them! 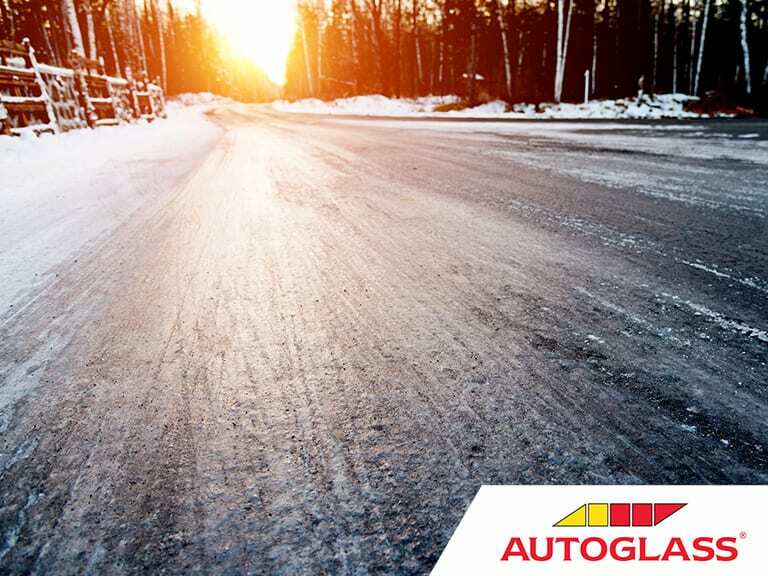 Clear all your windows and mirrors of any ice before you set off on your journey. Avoid applying boiling water directly to any icy areas as the heat can damage your car glass. Also, before driving in icy conditions, double check the condition of your wiper blades and don’t forget to thoroughly demist your windscreen and windows. Last but not least; don’t forget to carry a pair of sunglasses in your car. Your shades are more than just a reminder of nicer weather – they are also an indispensable safety tool. In snowy conditions – when the the sun is low in the sky – the glare can be blinding. So, keep your sunnies close at hand to avoid getting caught out. If the road ahead appears unusually glossy or polished, you may be about to encounter a patch of black ice. Black ice is a sheet of transparent ice that can be almost impossible to spot. When driving on icy roads, you should be extra vigilant of black ice in shady or sheltered areas like beneath large trees or in the shadows of high walls. When driving on icy roads, do your best to keep a uniform speed and avoid too much acceleration, breaking or erratic turning – anticipation of potential hazards and smoothness of execution are key. Except when you are driving downhill, it’s best to keep your car in the highest gear possible to avoid dangerous and unwanted wheelspin. When travelling downhill, especially through bends, it’s safest to revert to using a lower gear in order to stay in control. 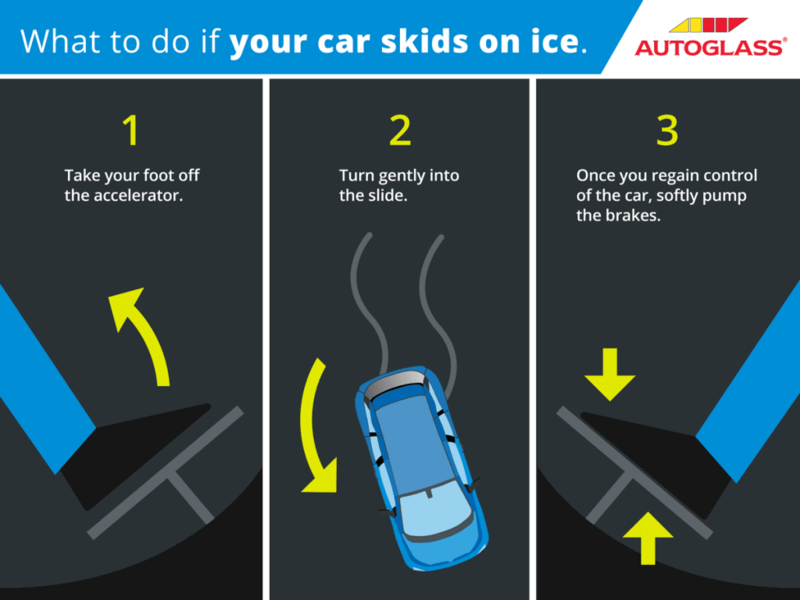 Even with the help of these tips for driving on ice, you can still get caught by surprise on an icy road. As ever, it’s crucial to stay calm and collected on the roads, even if you find yourself sliding out. Here is a quick guide on how to correct a slide safely. Keep in mind, the faster your speed, the more difficult it is to correct a slide. So, always be mindful of your speed in icy conditions. Stay off the Brakes – When you feel your car beginning to slip out, your first instinct might be to panic and slam on the breaks. This is an extremely common mistake by drivers. Heavy breaking will only serve to make a slide worse as for slide correction be effective, your wheels MUST be turning freely. Turn with the Slide – Turn your wheel the same direction that you feel the rear of your car sliding. As you begin to feel the car straightening out, straighten your steering wheel with it. A helpful mental trick is to focus your sights on where you WANT the car to go. The extent to which you turn with the slide should correspond to the extent to which the rear of the vehicle is sliding – a minor slide will only require a minor correction. The tricky part of managing a slide is that, once your car begins responding to your turning of the wheel, it is liable to snap back and begin sliding in the opposite direction. When you are correcting a slide in one direction, be aware that you may have to turn the other way with very little notice. This can happen a number of times before the slide correction process is complete, and you’ll need to be ready to respond appropriately. Don’t Panic – The biggest mistake you can make is to panic, overcompensate for the slide and send your car into a spin. Keep a cool head, follow the directions above, and you should be able to manage your slide with minimal fuss. Driving on Icy Roads might seem nerve wracking but with these simple tips you will be well equipped to arrive at your destination safely. Don’t forget to check the Autoglass Blog again soon for more explainers, guides, tutorials and tips. And finally; take your time, stay vigilant and drive safe on the roads this Winter.